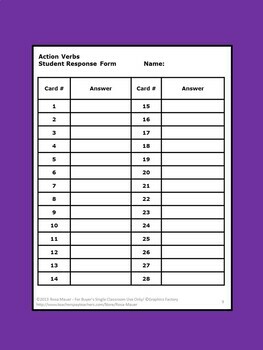 Verbs are the focus of these 28 task cards. 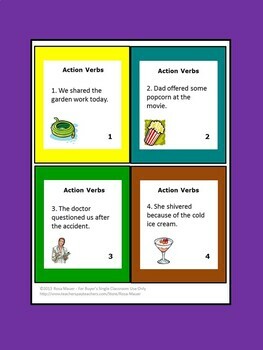 On each card there is one or more action verbs. 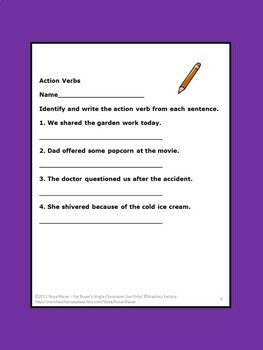 Students are to identify the action verbs from each sentence. Students may write the answers on the provided response page. Answers are given for the teacher. Text from the task cards is given in a printable worksheet format. 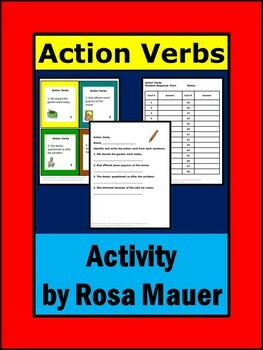 Additional worksheets are provided for more practice in using action verbs correctly. Check out the free sample preview to see if this product is right for you. Follow me to receive updates from my store. Visit my page to view products such as task cards, book units, and technology lesson plans. Products at Rosa Mauer’s store are for single classroom use only. Please do not post the product on school or other web sites.